Time to blurb a little. I’m not going to talk about the election, because it’s just so depressing. But I have been working in the garden, in bits and dabs, 20 minutes here, 30 minutes there, and it’s been lovely. The weather has been kind, the sun has shone, and it’s been very therapeutic. I’ve planted a nepeta (catnip) plant in a pot, which Bertie The Cat loves. Also a red hazel. I’ve weeded, dead-headed and cut back massively. Still stuff to do, of course, but the garden is currently looking wonderful. The pink dicentras are going bonkers. The bluebells are out, the tulips are lovely, and everything is budding or in leaf. One of my Christmas presents was a medlar tree, which I left in its little pot to winter in the cold frame, and have not long potted that up in a large pot. It’s going mad. Even fruiting. I dug up a lovely bergenia because the slugs and snails were eating all the leaves. I made sure the roots were clear of any soil and pests, planted it in a pot, protected the pot against invaders, and it’s going berserk. Leaves growing out of every available place. Beautiful. It’s like it’s saying “thank you”. And we’ve had our wonderful decorator in to do our bathroom and en-suite. I’m so pleased with how they look. He always does an excellent job. He’s quiet, methodical, neat and tidy. He clears up every night before he goes home. With a vacuum cleaner. Yup. He’s been doing our decorating for nearly 20 years now. Although we don’t have decorating done very often (to put it mildly). I painted our ensuite last time and I’m just crap at that stuff. All of a sudden the vileness of the colour hit me, then I started noticing anew the mess I’d made, so it’s just lovely to have a fresh, new, light colour. It was a peachy sort of colour and is now Dulux “Violet White” but is less white and more lilac. Lovely. We’ll get him in next year to do our kitchen and utility when we’ve had the kitchen done (finally). Tomorrow I’m going to try a “folk” size guitar. The 3/4 classical is a good size for me, and has a lovely sweet tone, but has a fat neck, and it’s very difficult to strum. So I’m trying an acoustic with steel strings and will see how that goes. If it’s too big still, I’m going to try a 3/4 size acoustic. Exciting. Knitting is going well.Finished socks and matching fingerless gloves for YD. Logan is coming on apace. We saw him last Monday and Tuesday. He’s wonderful. 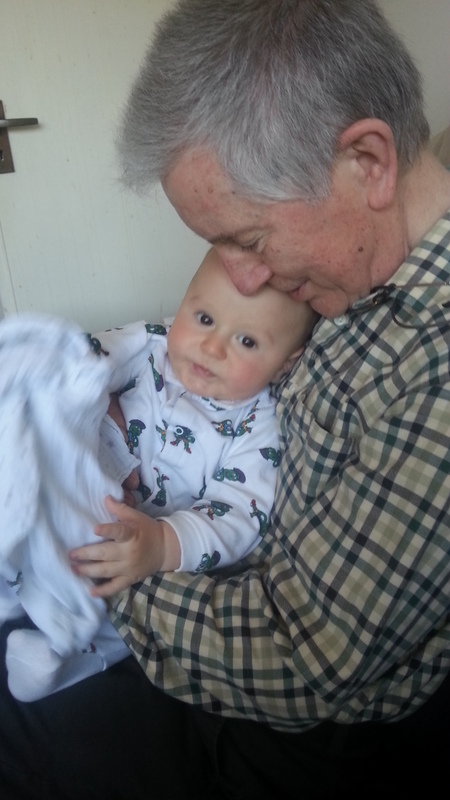 Very smiley and giggly, and loves being sung to and jiggled about. Tonight he’s had his first solid food – a sweet potato chip. Looks like he enjoyed it . . . he’s already in 9-12 month age clothes, and he’s just 5 months yesterday. 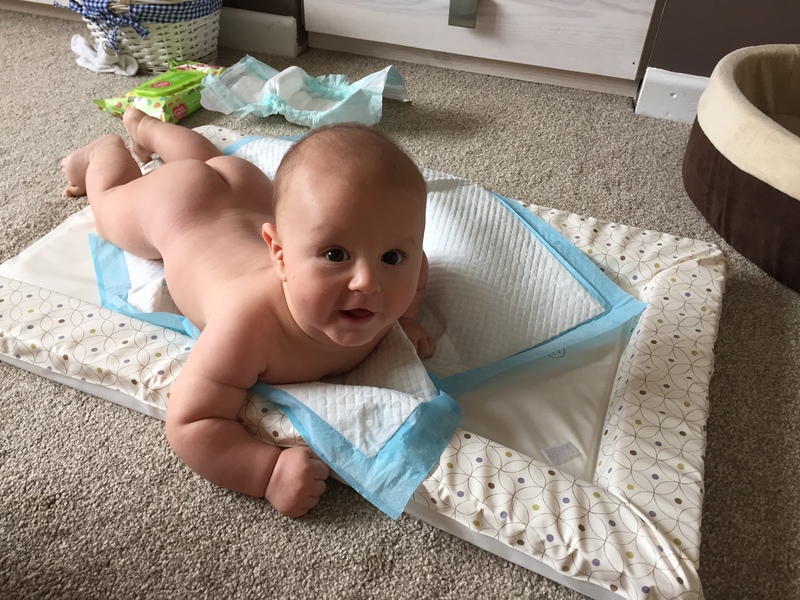 We don’t do puny babies in our family. I was a very puny baby, but first hubby was tall, so ED and YD are much taller than me. That’s about it I think. Might take/post some photos of the plants if the weather allows. Went to a hustings on Wednesday night about the NHS. Five Parliamentary candidates were there, Labour, Tory, Lib-Dem, Green and UKIP. Questions were asked by the audience and taken by the panel, with time to read them first. I sat next to a guy who was clearly a rabid right-wing Tory. Every time equality, or tax, or narrowing the gap between rich and poor, was mentioned, he tutted loudly or groaned aloud (along with a sizeable portion of the rest of the audience). At one point somebody else, while making a point, said he was a member of the union UNISON. And this guy next to me muttered “There’s a surprise”. I couldn’t hold back any longer. Up to that point I had managed to contain myself, and clap loudly the Labour or Green candidates, and ostentatiously *not* clap the Tory/UKIP candidates. But this was a step too far. So I turned to him and said “That’s a Bad Thing, is it?” and he had no response. How can people openly be scornful of equality? what is wrong with equality? How is it a Bad Thing? I suppose if you’re very rich you just don’t want to share your goodies with the very poor. The attitude seems to be that rich people are rich because they’re better, somehow, innately superior, and poor people are poor because they’re just stupid or inferior in some way. I have actually heard this said. There seems to be a selfish meanness among many middle-class people. Resentful of the poor, who are portrayed as taking away their “hard-earned” money, and resentful of the rich, who are what they aspire to be. It’s just mean, mean-spirited, nasty and selfish. I’d happily pay more tax if it would make a fairer society, or help the NHS. It would make hardly any difference to me, and so much difference to those less fortunate. What is bad about being in a trade union? I suppose if you’re a boss of a company you see the union as a barrier to exploiting the workforce even more than they’re already exploited. But if you’re an employee, being in a union is absolutely essential to make sure you aren’t taken advantage of (to put it mildly), summarily sacked, employed with unfair or unreasonable terms and conditions, bullied – the list goes on. Is tax a bad thing? If you’re really rich you can maybe afford your own security guards, private health and private education. So you wouldn’t, like normal people, like me, need state-provided health care, education or police. In Scandinavia the taxes are much higher, but then the state-provided services are much better. And it’s a much fairer, more equal, society. How do rich people manage in a recession? they sell a house abroad, or possibly a field, or maybe a horse or two. How do poor people manage in a recession? they decide whether to eat or heat the house (for which they may be paying extortionate rent). They go to food banks and eat what they’re given. Take a look at this page. It explains in detail how benefits are dished out. You can clearly see that a very large proportion is on pensions, but the right-wing would have us believe most of the money is spent on “skivers” rather than “strivers”. Why are the poor demonised? let’s have a go at the bankers, who caused, let’s not forget, a global recession, not just one in this country. And they’re still laughing all the way to the, erm, bank. I saw one stupid rich woman post on the internet that the way for poor people to eat better is to “plant a small orchard”. What planet does she live on? where does she think they will plant one tree, never mind several? how does she think they can afford to buy a tree? how long do trees take to bear fruit? Honestly. And I can’t remember which politician said that poor people don’t know how to cook, and when she was called on it, her excuse was “oh I was speaking unscripted.” That means she meant it, and wasn’t following the autocue. That’s not ok. There is a sharply defined class system in this country. There is a forelock-tugging sycophancy to anybody remotely royal/rich/upper class. Why? I was delighted to hear Andy Murray’s wedding today described as “Scotland’s Royal Wedding”. At least he’s done something to deserve the adoration and fuss. Go you, Andy Murray. During the French Revolution, there was undisguised panic by the upper classes in this country. What if the masses decided to revolt like those across the Channel? I don’t understand, I really don’t, why there isn’t a “Peasants’ Revolt” brewing now. Maybe there is, and the media just aren’t covering it, because the media know on which side their bread is buttered, and by whom. Social media helps. Stuff that isn’t broadcast by the press is often on facebook. There are lobbying groups like sumofus.org and 38degrees.com. Owen Jones is a very interesting, articulate guy. Go and see him if you can. He’s on TV a lot and very good. Think I’m done now. But I’m still quite cross. Today I was going to go to a local craft fair, to one particular stall, run by a young woman who comes to the knitting group. She’s very young, 16 at the most, and a crochet whiz. She’s absolutely amazing. Fast as lightning, and doesn’t use a pattern either. She makes the most beautiful crochet animals, with a Japanese twist, just out of her head. I’d really like to support her, and was thinking of getting some of her creations for Christmas or birthday presents. But today’s not a good day. I helped put away the shopping, and had a shower and got dressed, and that’s it. That’s me done for the day. The tremor is quite bad today and I’m all of a doo-dah. Bit weepy and pathetic. Used some of my Chanel No 5 talcum powder after my shower. Washed my hair and everything. Small things to make me feel better. So I made us both a cup of tea, and sat down at the computer and played Solitaire for a while, then a game of Mahjong with a particular tile set I like (it has Greek letters and Roman numbers, so bends my brain in a different way from the usual Mahjong pictograms). I’m seeing the doctor in about ten days, and need to speak to her about how low I’ve been. Not sure what she’ll suggest, as I’m on almost the highest dose of antidepressants anyway. But we shall see. There is some gardening to do – planting a rose and a medlar tree, both gifts, which I’m really looking forward to. But I know that it would just not be wise to do it today. Tomorrow and Monday are forecast to be fine and even sunny, so one of those days perhaps. The bathroom needs a thorough cleaning, and that’s in the plan too. Not nearly as much fun as gardening though, huh. 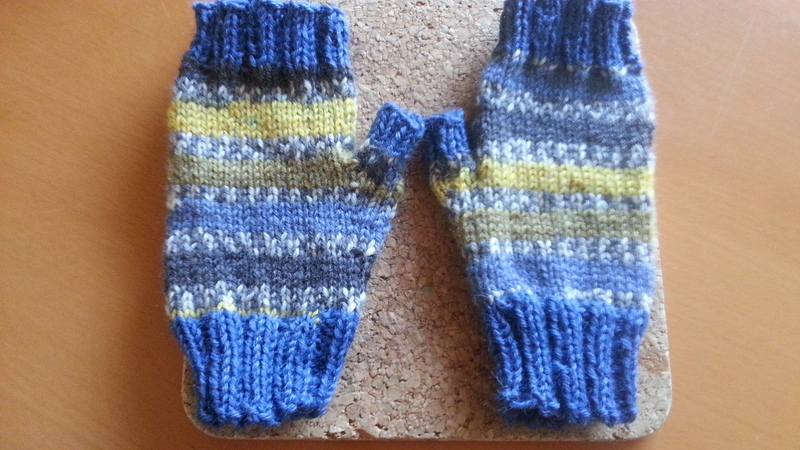 Have been knitting things and am pleased with what I’ve made. 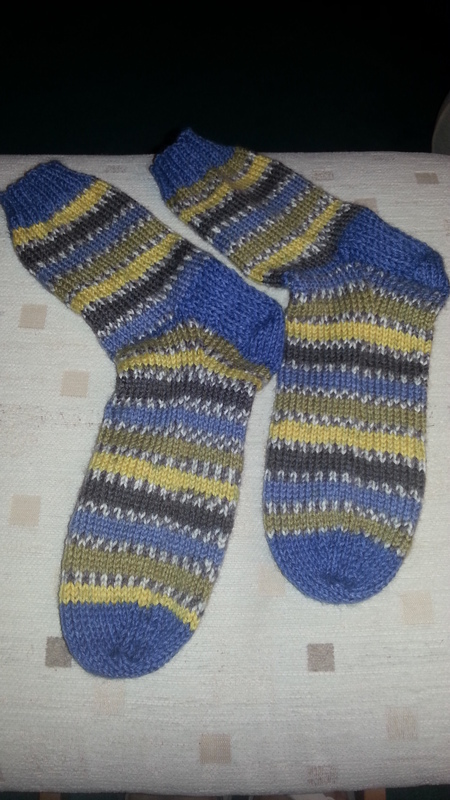 Just started on a pair of socks for YD. I’ll post photos when they’re done. Fabulous yarn. West Yorkshire Spinners DK. Plain for the welts/heels/toes, and printed for the leg and body. Lovely to knit with. 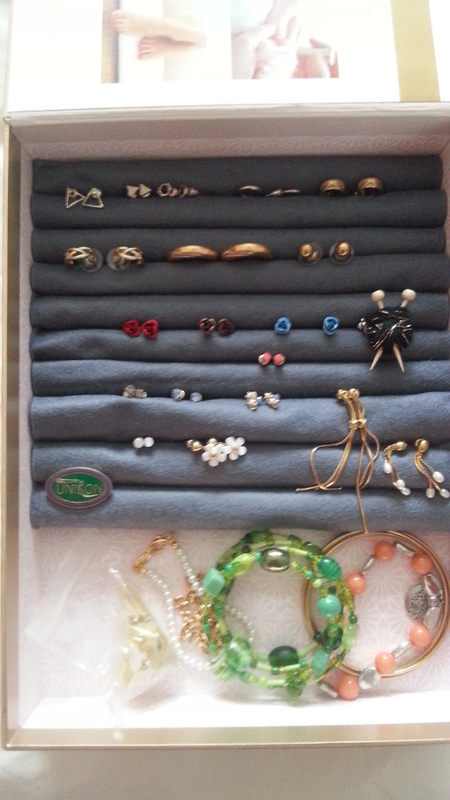 Also re-organised my earring storage. 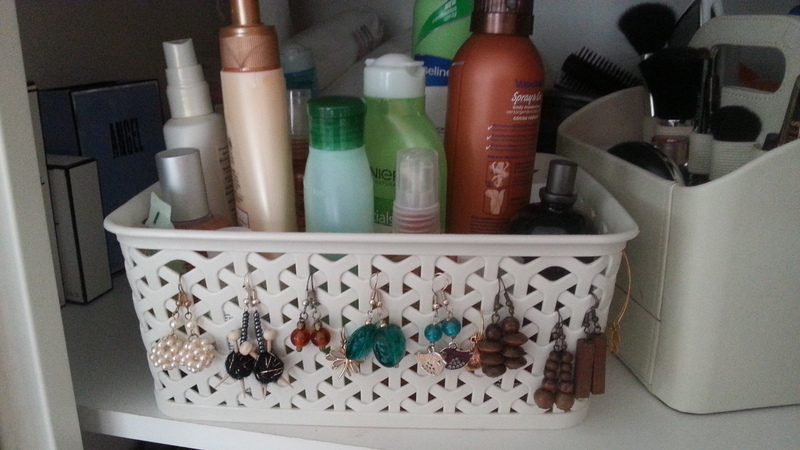 Next up is necklace storage – special hooks ordered. Have been having problems with the network/hi-fi system, but it seems to be sorted now. A bit Heath-Robinson, because there’s a 30 metre ethernet cable trailing across the lounge/hall/study, so that the DS is connected directly and physically to the router. You’d think, in this day and age, that there’d be something a bit less messy. Plans to get it done properly and surface mounted, with proper cable. I’m thinking we need STP (Shielded Twisted Pair) rather than UTP (Unshielded Twisted Pair) because it will be a permanent installation, so doesn’t need to be particularly flexible, but does need to resist interference. Need to talk to the installers. It’s been doing my head in, because his music so important for hubby. It would be for me like not being able to knit. So I like to make sure, if I can, that it all works. I’m sick to death of the election already. Promises, promises, promises. Hmph. Oh well. That’s it really for today.